Troubleshooting, testing and inspection skills to investigate the loss of power distribution in time sensitive circumstances. Buffalo Wild Wings has a restaurant in a plaza on Wonderland and Southdale in London. On another Monday morning, PTN Electrical received an emergency call and we rescheduled a team to attend the site. The restaurant had obviously called multiple electrical contractors and PTN were the first to respond. The restaurant, kitchen and facilities were completely out of power and the restaurant needed to ensure that the problems was fixed as soon as possible as the restaurant was due to open for lunchtime service. On arrival, one of the restaurant staff members advised PTN’s electrician that they had heard a bang in one of the main distribution panels. Upon inspection it was found that one of the 600 volt, three-phase, four-wire, 400 amp, 42-circuit, distribution panel boards was at fault. It was determined that the fault was most probably caused by a three-phase circuit breaker faulting and shorting across the main panel bus bars, causing irreparable damage to the panel board. It was also discovered that this damaged panel board operated the main incoming 400-amp fuses within the plaza’s electrical room. As a new, replacement, like for like 400-amp panel board could not be sourced immediately, (a new panel board would need to be specially built by the manufacturer and would not be available until one week later), it was necessary to find an alternative solution. And fast. 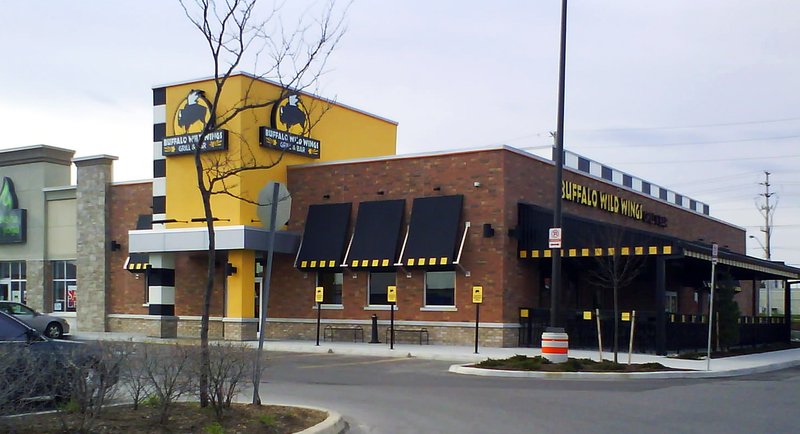 Upon discussion with Buffalo Wild Wings headquarters, it was imperative that the restaurant stayed operational, and as this panel board served the heating and cooling roof top units and the kitchen ventilation, an alternative was definitely required. PTN Electrical decided the best course of precautionary action would be to test and inspect the existing 600-volt, 400-amp panel board to verify that it could be used as a temporary measure with replacement circuit breakers. Following the visual inspection of the panel board and the 1000-volt insulation resistance testing, it was deemed possible to use the panel board with replacement circuit breakers. The mounting space of the circuit breaker that had originally caused the damage was unusable however, but it was decided by HQ that the restaurant could operate with one less roof top unit just for that week. Replacement circuit breakers were sourced and replaced in the panel board with new main incoming 400-amp fuses and power was restored and the restaurant opened as scheduled for lunch. As an additional precaution, PTN used their thermal imaging camera to determine whether this was a safe course of action. All tests were satisfactory. Once the newly built panel board was delivered by the manufacturer, PTN Electrical arranged an out of hours installation so as to avoid further disruption to the restaurant. Buffalo Wild Wings had not previously been a customer of PTN Electrical, but they were so happy with our solutions, organization skills and professionalism, we are now on their preferred supplier list.